The BSP chief has accused the BJP of being indifferent to incidents of mob-lynching in the states in which it is in power. Lucknow: The Bahujan Samaj Party (BSP) will be compelled to go it alone if it does not get a “respectable” number of seats in the anti-BJP alliance that is shaping up before the 2019 Lok Sabha polls, former Uttar Pradesh chief minister Mayawati said Sunday. The BSP chief also said that instances of mob lynching in the name of cow protection were a “blot on democracy” and accused BJP governments in various states of being indifferent to the problem. 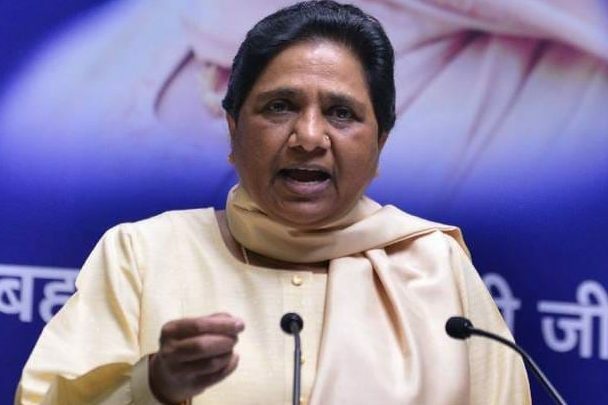 At a press conference, held for the first time in her new accommodation here after she was forced to vacate her sprawling bungalow on Supreme Court orders, Mayawati made clear her party might be compelled to go it alone if it does not get a “respectable number” of seats in the anti-BJP alliance. “Our party is not against the alliance, but our stand is very clear that we will ally with a political party only if we get a respectable share of seats. Otherwise, our party feels it better to contest the elections alone,” she said. On the 2019 Lok Sabha elections and the upcoming Assembly elections in certain states, Mayawati said, the effort of the opposition parties will be to stop the BJP from coming to power at any cost. Maywati targeted the BJP claiming that its governments in the Centre and states had “worsened” the condition of the people by showing them false dreams. “These governments have done no good to people barring a few industrialists,” she alleged adding that “both the NDA and the previous UPA governments were equally responsible for shielding the corrupt”. Mayawati also said the “increasing tendency” of mobs indulging in lynching in the name of cow protection in the “BJP-ruled states” was a blot on democracy. Yet the governments (in these states) are exercising laxity and are being indifferent to it, she claimed. “These activities of the BJP governments against the Dalits, Tribals, backwards, Muslims and Christians are going on from their inception and are a result of the party’s intention to go against the Constitution…This has been part of the basic policy of the BJP, which has assumed alarming proportions after they came to power,” she alleged. Continuing her attack on the BJP, Mayawati claimed that the party after forming the government was trying to crush the democratic movements and resorting to “terror tactics” in this regard. “After the April 2 ‘Bharat Bandh’ called by Dalit organisations, atrocities are going on,” she alleged. Accusing the BJP of resorting to “diversionary tactics” as Lok Sabha elections were approaching, Mayawati said the saffron party was not leaving any stone unturned to “derive advantage from the demise of former Prime Minister Atal Bihari Vajpayee”. “As the Lok Sabha elections and Assembly elections are approaching in certain states, the BJP is resorting to different tactics to hide its failures and is making lucrative announcements. In this matter, they (BJP) are not leaving any stone unturned to derive advantage from the demise of former Prime Minister Atal Bihari Vajpayee. They never followed his footsteps, when he was alive,” she alleged. “If Prime Minister Narendra Modi and BJP followed the footsteps of Vajpayee and ran the government accordingly, there would not have been religious frenzy and communal incidents. Nor there would have been the rule of mobocracy,” she claimed. People know the campaign undertaken by the BJP and RSS in the name of Vajpayee is an attempt to hide failures, she said continuing her attack. The BJP will not get any benefit from this, she claimed. The people of the country now understand that none of the election promises made in 2014 Lok Sabha elections was fulfilled, she said. Mayawati also allehed that the Centre was not able to come clean on the Rafale deal. Referring to demonetisation, Mayawati said it was done in an unplanned manner leading to a “financial emergency”. The BJP government should now at least tender an apology over the “national tragedy”, she said.